Every year, more than 41,000 people die by suicide, making it the tenth leading cause of death in U.S. While these statistics are sobering, Suicide Prevention Awareness Month reminds us that dying by suicide is not an inevitability. In fact, for every one person who dies by suicide in the U.S., there are approximately 278 people move past serious thoughts of suicide, and nearly 60 who have survived a suicide attempt, the overwhelming majority of whom will go on to live out their lives (National Action Alliance for Suicide Prevention). Suicide is preventable, yet it remains a highly stigmatized topic that many of us feel uncomfortable discussing, even with friends and loved ones. At Beacon, we believe that educating ourselves and others, and talking openly about our experiences with suicide, is a crucial step in suicide prevention. In February 2017, we released our white paper “We Need to Talk about Suicide,” which promotes the Zero Suicide model as the evidence-based solution for shifting the way we think about and treat suicide. The paper offers best practices around the model’s seven prongs: lead, train, identify, engage, treat, transition, and improve. Beacon’s clinical leaders shared these best practices with our partners in a Zero Suicide webinar. 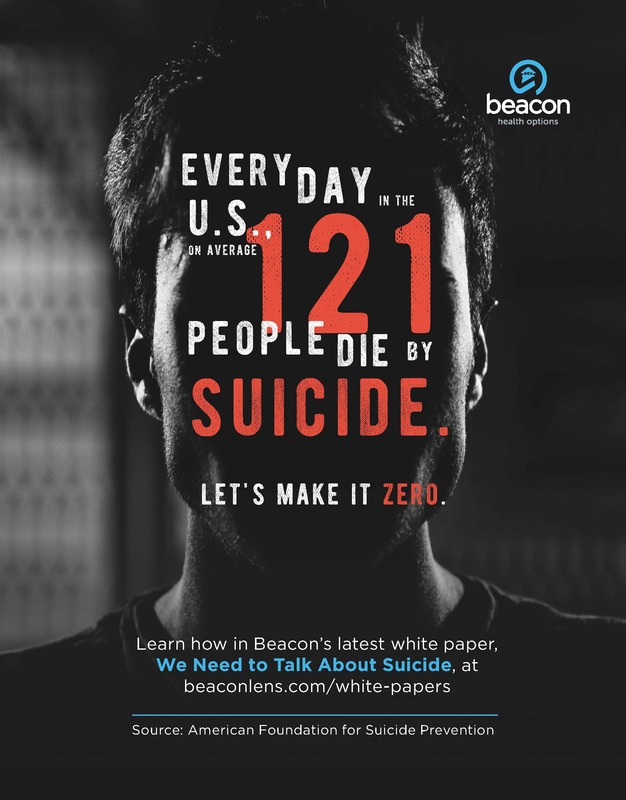 Beacon also initiated its own company-wide Zero Suicide campaign, starting with workforce training and establishing a leadership culture around suicide prevention and treatment. We’ve now begun Mental Health First Aid (MHFA) training for our staff to support the Zero Suicide initiative. Many employees are volunteering to become Zero Suicide champions and become trained in MHFA; in early August, we graduated nine Beacon colleagues from the program, adding to the number of individuals in our New York and Colorado offices who are already MHFA certified. Our objective is for 1,200 employees to complete MHFA training in the first year of the program, with an ultimate aim of every Beacon employee, no matter their role, completing the eight-hour course. Additionally, we’ve called on Beacon employees to share their personal stories about suicide, either as a blog post or video, or simply in conversation with friends and coworkers. You can read a series of these employee stories on our blog Beacon Lens. As part of Beacon’s commitment to combating the opioid crisis, we also promote best practices and provide education to the providers on the front lines of treatment. As a partner in Project ECHO, an innovative health care initiative that’s revolutionizing the way non-specialty providers treat opioid use disorders, Beacon is helping improve access to evidence-based treatment for opioid use disorder in community settings, including a special focus on MAT. You can learn more about Project ECHO on Beacon Lens. If you or a loved one is experiencing a mental health crisis or thoughts of suicide, help is available 24/7 through the National Suicide Prevention Lifeline at 1-800-273-TALK (8255), or visit their website to chat online.